Plantago major is an indicator of environmental pollution in the city. The plant grows along the traversed paths, close to the sidewalks. Contaminating substances accumulate on the leaves of the plantain. In the summer of 2016, samples of plants were collected in the central Murmansk region for analysis using a scanning electron microscope to identify dust particles on their surface, and to study leaves using the ICP-MS method to determination of heavy metals content. A relatively serious concentration of lead, zinc, copper, nickel as well as high arsenic and chromium content has been demonstrated in the city center, along with ties with human activities (vehicular traffic). High iron content is associated with peat soils used in the city for fertilization. The remaining metal content is relatively low. 1. General geographic regional atlas "Murmansk region" - 439 Central Experimental Military- Cartographic Factory Ministry of Defence of the Russian Federation, edn. 1, 2007 [in Russian]. 2. Titov AF, Talanova VV, Kaznina NM, Laidinen G. Stability of plants to heavy metals. Petrozavodsk, Publishing house of the Karelian Scientific Center of the Russian Academy of Sciences. 2007 [in Russian]. 3. The population of the Russian Federation for municipalities on January 1, 2010 [in Russian]. 4. Mazur Z, Radziemska M, Fronczyk J, Jeznach J. Heavy metal accumulation in bioindicators of pollution in urban areas of northeastern Poland. Fresenius Environ Bull. 2015; 24(1a): 216-223. 5. Siromlya TI. Influence of traffic pollution on eco-logical state of Plantago major L. Contemp Probl Ecol. 2011; 4: 499-507. 6. Yoon J, Cao X, Zhou Q, Ma LQ. Accumulation of Pb, Cu, and Zn in native plants growing on a contaminated Florida site. Sci Total Environ. 2006; 368: 456-464. 7. Andrzejewski R. Problemy ekologiczne kształtowania środowiska w mieście. Wiad Ekol. 1975; 21: 175-186. 8. Brightman FH. Some factors influencing lichen growth in towns. Lichenologist. 1959; 1: 104-108. 9. Cela A, Lankford L, Knowles-Lankford J. Visitor spending and economic impacts of heritage tourism: a case study of the Silos and Smokestacks National Heritage Area. J Heritage Tourism. 2009: 3. 10. Dominici F, McDermott A, Daniels M, Zeger SL, Samet JM. Revised analyses of the national morbidity, mortality, and air pollution study: mortality among residents of 90 cities. J Toxicol Environ Health Part A. 2005; 68: 13-14, 1071-1092. 11. Koptsik SV, Koptsik G. Sol pollution in terrestial ecosystems of the Kola peninsula, Russia. 10th International Soil Conservation Organization Meeting, 24-29 may, 1999: 212-216. 12. Dod RL, Giauque RD, Novakov T. Sulfate and carbonaceous aerosols in Beijing, China. Atmosph Environ. 1986; 20: 2271-2275. 13. Fenger J, Hertel O, Palmgren F. Urban air Pollution, European Aspects. Kluwer Academic Publishers, Dordrecht, 1998. 14. Koptsik GN, Niedbaiev NP, Koptsik SV, Pavluk IN. Heavy metal pollution of forest soils by atmospheric emissions of Pechenganikel smelter. Eurasian Soil Sci. 1999; 32(8): 896-903. 15. Mukai H. Regional characteristics of sulfur and lead isotope ratios in the atmosphere at several Chinese urban sites. Environ Sci Technol. 2001; 35: 1064-1071. 16. Nadgórska-Socha A, Ptasiński B, Kita A. Heavy metal bioaccumulation and antioxidative responses in Cardaminopsis arenosa and Plantago lanceolata leaves from metalliferous and non-metalliferous sites: a field study. Ecotoxicology. 2013; 22(9): 1422-1434. 17. Pereverzev VN. Peat soils of the Kola Peninsula, Eur Soil Sci. 2005; 38(5): 457-464. 18. OECD. Motor vehicle pollution. Reduction strategies beyond 2010. Organisation for Economic Co-operation and Development, Paris, 1995. 19. Shi Z, Shao L, Jones TP, Lu S. Microscopy and mineralogy of airborne particles collected during severe dust storm episodes in Beijing, China. J Geophys Res. 2005; 110: D01303. 20. Xie S, Zhang Y, Qi L, Tang X. Spatial distribution of traffic-related pollutant concentrations in street canyons. Atmosph Environ. 2003; 37: 3213-3224. 21. Xu XD, Zhou L, Zhou X. Influencing domain of peripheral sources in the urban heavy pollution process of Beijing. Sci China Ser D. 2005; 48: 565-575. 22. Huber M, Zhigunova GV, Dębicki R, Lata L. Plasters analysis, from selected cities in Murmansk Oblast (N Russia) as an indicator of environmental pollution. Murmansk State Arctic University, 2018: 170. 23. Huber M, Blicharska E, Lata L, Skupiński S. Effect of substrate for metal content in selected plants in terms of environmental protection. Science Publisher, 2016: 255. 24. Aamlid D, Venn K. Methods of monitoring the effects of air pollution on forest and vegetation of eastern Finnmark, Norway. Norw J Agr Sci. 1993; 7: 71-87. 26. Levei L, Kovacs E, Hoaghia MA, Ozunu A. Accumulation of heavy metals in plantago major grown in urban and post-industrial areas. Studia Ubb Chemia. 2018: 63(1): 87-98. 27. Kurteva MK. Comparative study on Plantago major and P. lanceolata (Plantaginaceae) as bioindicators of the pollution in the region of the Asarel Copper Dressing Works. Phytol Balcan. 2009; 15(2): 261-271. 28. Buszewski B, Jastrzębska A, Kowalkowski T, Górna-Binkul A. Monitoring of selected heavy metals uptake by plants and soils in the area of Toruń, Poland. Pol J Environ Stud. 2000; 9(6): 511-515. 29. Peel MC, Finlayson BL, McMahon TA. Updated world map of the Köppen-Geiger climate classification. Hydrol Earth Syst Sci. 2007; 11: 1633-1644. 30. Protasova NA. Heavy metals in chernozems and cultivated plants in the Voronezh region [in Russian]. Agrochemistry. 2005; 2: 80-86. 31. Yaytsev VS, Kuznetsova LA. The question of the effect of liming on soil and agricultural products contamination with heavy metals and radionuclides [in Russian]. Russian Agric Sci Rev. 2015; 5(1): 49-54. 32. Kirilyuk LI, Zakharina TN, Bakhtina EA. Heavy metals in the plants of the Yamal region and the formation of the principle of ecological infrastructure [in Russian]. Adv Modern Nat Sci. 2005; 7: 60. 33. Putilina VS, Galitskaya IV, Yuganova TI. Adsorption of heavy metals by soils and rocks. Characteristics of the sorbent, conditions, parameters and mechanism of adsorption Ecologists [in Russian]. A series of analytical reviews of world literature. State Public Scientific and Technical Library SB RAS (Novosibirsk) 2009; 90: 1-155. 34. Skugoreva SG, Ogoronikova SY, Golovko TK, Ashikhmina TY. Phytotoxicity of organophosphorus compounds and mercury [in Russian]. Ekaterinburg, 2008: 153. 35. Gribacheva AA, Shemyakin VO, Shushpanova DV. Getting gasoline. Obtaining the required octane number [in Russian]. Social Humanit Herald South Russia. 2014; 7: 86-91. 36. Eal R. The importance of microelements in plant nutrition. Problems and their solution when using chelates [in Russian]. Gavrish. 2007; 4: 13-17. 37. Subbotina MV, Zhukova DV, Smolyanskiy ES, Ecological consequences of motorization and ways of their elimination in cities, Youth and scientific and technical progress in the road sector of the South of Russia [in Russian]. Materials of the IV Scientific and Technical Conference of students, graduate students and young scientists. Volgograd State Architectural and Construction University (Volgograd) 2010: 291-297. 38. Fedorov PV, Obryadina TA. All-union population census of 1939 and political repressions on Murman [in Russian]. 1939. 39. Bgantsova МV. Use of Sinapis alba L. and Lolium perenne for phytoremediation of lead-contaminated soils [in Russian]. Agrophysics. 2011: 22. 40. Ushakov IF. Kola Land. 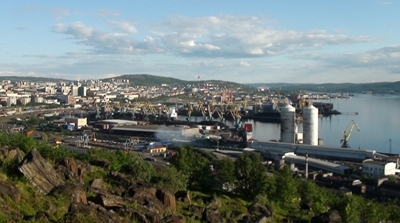 Murmansk, History of Murmansk seaport [in Russian]. 1972.